Click on the graphic below for help on the options categories or scroll the screen down for a text description of the Filter options fields. Note: Use the Complex File Mask dialog to ‘filter’ files by file name or path. Exclude File(s) by Date: When ‘Reverse Filters’ is disabled, the ‘Before Date’ setting excludes all files whose date stamp precedes the date entered and the ‘After Date’ excludes files whose date stamp falls after the date entered. Enabling ‘Reverse Filters’ causes the settings to function in the opposite fashion – an ‘include only’ setting. You may enter values in one or both date fields. By combining settings, you can limit operations to files whose time stamp falls in a specific range. For example, to process only files that were last modified in November 2010, enter a “Before Date” of 10/30/2011and an “After Date” of 12/01/2011. Date exclusions can also be combined with one or both of the exclude by size filters. See Size and Date Filter Examples for more examples. You can also enter the special token – %%today%%. This code is intended for manually edited scripts and not the GUI, but it does work. The program converts the entry to either the current date or the value calculated. For example, if you enter %%today-10%% and the current date is March 17, 2010, the program will convert this to March 27, 2010. Exclude File(s) by Size: When ‘Reverse Filters’ is disabled, the ‘Less Than’ field excludes all files whose size is smaller than the value entered and the ‘Greater Than’ setting excludes files whose size is larger than the value specified. Enabling ‘Reverse Filters’ causes the settings to function in the opposite fashion – an ‘include only’ setting. Size units may take the form of number of bytes or whole K, KB, or M values, e.g., 100K, 100KB, 1M, 4M. Do not specify fractional values when using K, KB, M quantities. You may enter values in one or both size fields and size exclusions may be combined with one or both date exclusion values. See Size and Date Filter Examples for some samples. Attributes: Select one (or more) attribute-types to exclude from your operation. Dim: The attribute is not considered in any filter. Checked: Files that do not have the checked attributes will be included. For example, to do an operation on files that do not have archive set, check ‘Archive’. To list files that are not ‘ah’, check ‘Archive’ and ‘Hidden’. The checked attributes are ‘ANDed’, meaning all the checked attributes must be present. For example, when ‘Archive’ and ‘Hidden’ are checked, ‘a’, ‘h’, ‘ar’, ‘as’ are listed but ‘ahr’ or ‘ah’ are not. Unchecked: Files having that attribute in combination with any other unchecked attribute are included. For example, to include ‘a’ and ‘ro’, uncheck ‘Archive’ and ‘Read Only’. Combinations of Checked and UnChecked: Checked and unchecked creates an ‘OR’ relationship between the checked and unchecked items. For example, ‘Archive’ unchecked and ‘Read Only’ checked eliminates ‘r’ from the operation that are either ‘r’ alone or do not have ‘a’ involved as well. This means that ‘rsa’ files would be included but not ‘rh’ files. To continue, if ‘Archive’ is unchecked and both ‘Read Only’ & ‘Hidden’ are checked, files that are both ‘rh’ are eliminated except for files that also include ‘a’. Attributes have many possible choices and combinations of checked/unchecked can be confusing. A ‘dim’ check in all attributes fields and Reverse Filters off (unchecked) is the program default. If you need to return to baseline, make your settings appear like they do in the graphic here. When Reverse Filters is disabled checked choices originate from the perspective of an ‘exclude’ filter. For example, if ‘System’ alone is checked, all ‘s’ files are excluded. If ‘System’ and ‘Read Only’ are checked, files that are ‘sr’ in some way are excluded. If you need to ‘filter’ files by file name or path, use the Complex File Mask dialog. 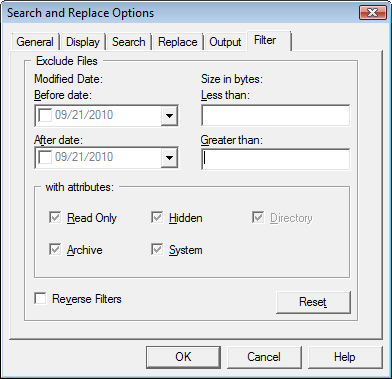 Reverse Filters: Reverse Filters is used to make the Minimum & Maximum Size, Minimum & Maximum Date, and File Attribute settings work as ‘inclusive’ filters. Dim vs. Checked vs. Unchecked for Attribute choices work in a similar fashion to when Reverse Filter is off except that logic works toward including files instead of ruling them out. For example, Reverse Filter = On, ‘Archive’ & ‘System’ checked includes files that are ‘as’ in some way. If Reverse Filter = Off, no ‘as’ files are listed. er = On, Minimum Date=11/01/2011, Maximum Date Filter=11/30/2011, and ‘Archive’ is checked, ‘a’ files 10/31/2011or earlier AND those 12/1/2011or later will be included. Reset Button: Click this turn off all filter settings by resetting the fields back to the defaults.